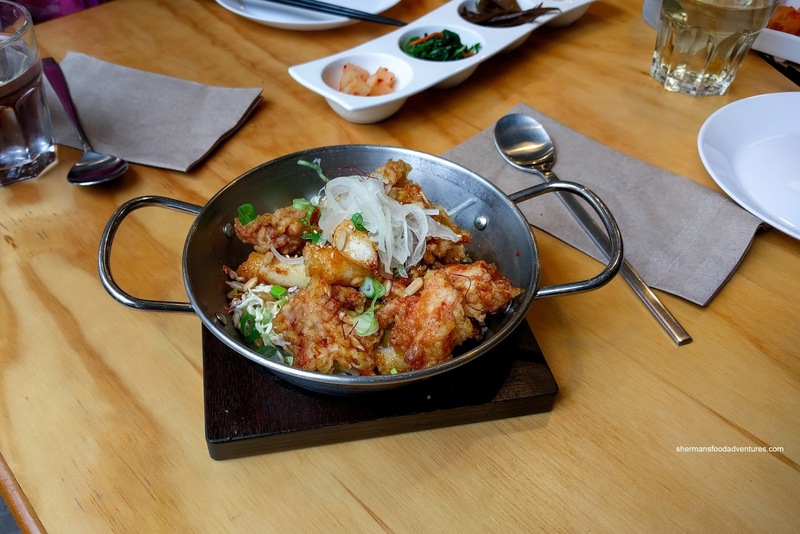 Often, fusion or the modernization of a classic cuisine (particularly an Asian one) can elicit strong opinions. Some see it as a way to excuse authenticity or even worse, the "bastardization" of the cuisine. However, my belief is more progressive. For instance, we wouldn't be blessed with delicious Vietnamese cuisine (as we now know it) if there wasn't influences from the colonizing French. 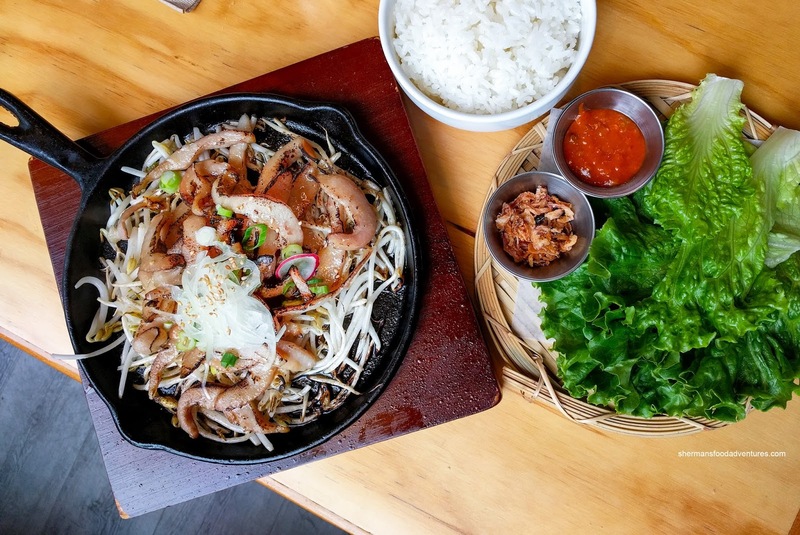 We've seen plenty of that going on with Chinese and Japanese food, but not until recently have we've seen Korean food get the same treatment. We stopped by one of these modern Korean restaurants at Maru in North Vancouver located in the former Cheers Restaurant. 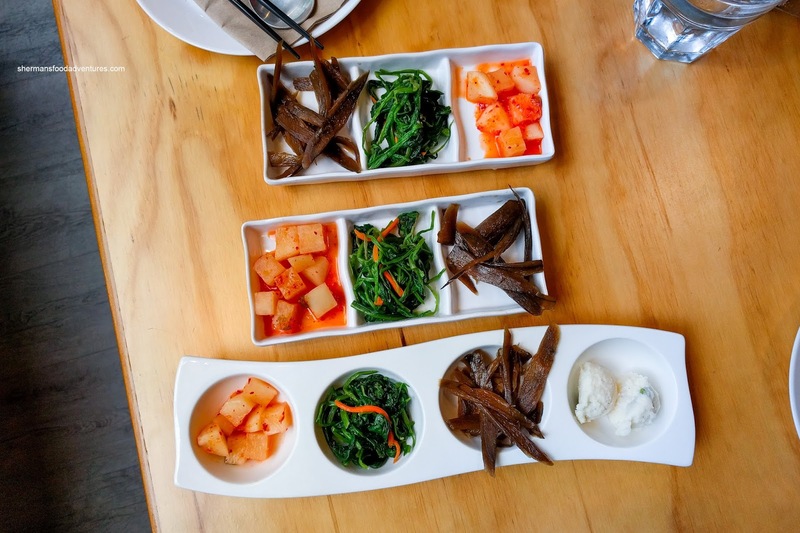 Served on "updated" plates, the Banchan consisted of daikon kimchi, spinach, burdock root and potato salad. Nothing amiss with them and we got plenty for the table. 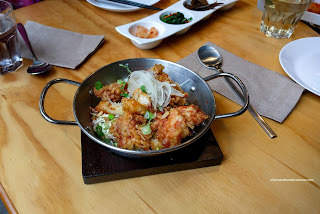 Modest in size, but nicely plated, the Korean Fried Chicken was fabulous. Each piece was firmly crunchy but not heavy. Inside, the meat was succulent and juicy. We chose the soy garlic flavour and it was apparent, but not overly strong. They only lightly tossed the chicken in it. We found the fried rice cake a bit too chewy and hard for our tastes. Underneath, the coleslaw was tangy and creamy with a nice crunch. 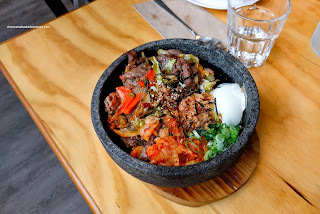 Sizzling hot, the Bulgogi Dolsot was chock full of ingredients including soy beef, kimchi, pickles and a poached runny egg. When mixed together, there was a smoky sweet umaminess which was not overpowering. Rather, it merely flavoured the rice accordingly and was a pleasure to eat. The dolset was hot enough to create a crust where there was some crunch and nuttiness. We also got the Miso Glazed Grilled Pork Cheek Lettuce Wrap which came with crispy shallots, rice, romaine and bean paste. Although the pork cheek was smoky, it had a propane-torch finish in taste. No matter, it was bouncy and tender while mildly sweet. Combined with the rest of the ingredients, this was another decent dish. 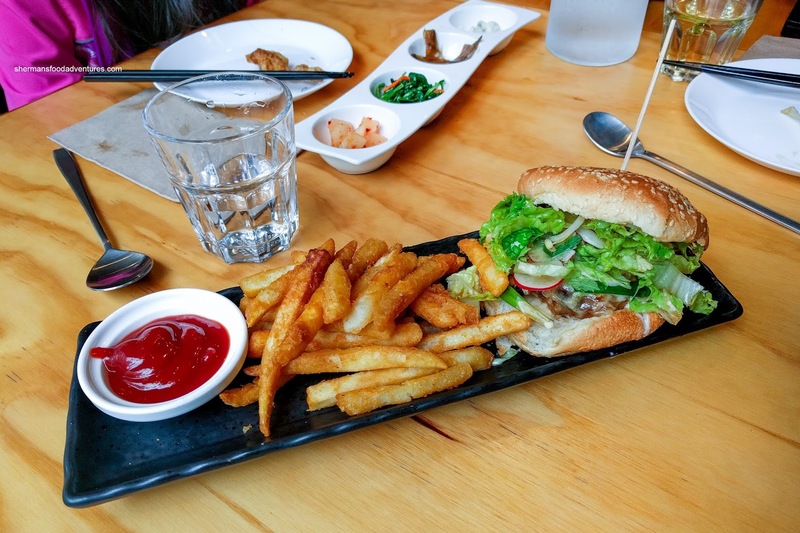 We decided to go off the board and try their Ddok Kalbi Burger with fries. Although it wasn't the sexiest-looking thing, it ate very well. The charred burger patty was intensely flavoured with caramelized sweetness and plenty of savoury meatiness. The greens on top were crunchy and had a nice tangy dressing. The fries were the typical starch-covered variety which meant they were lightly crispy. 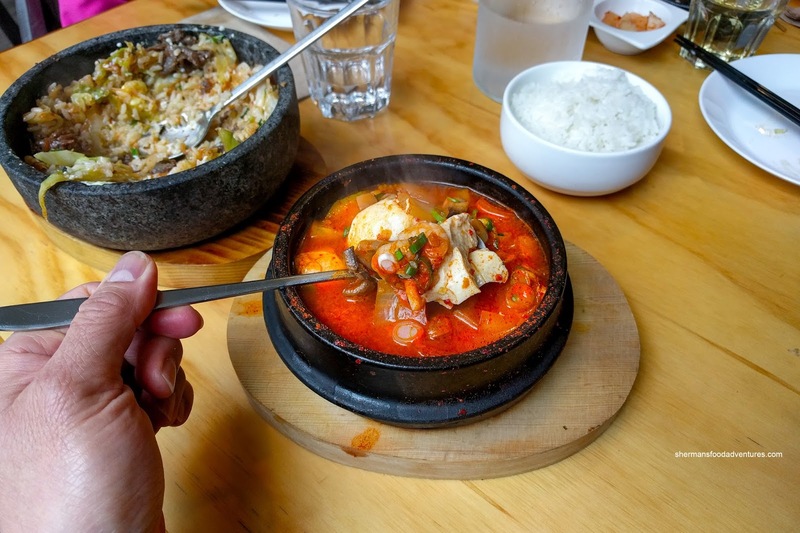 Lastly, we had the Seafood Tofu Soup which was also quite flavourful. 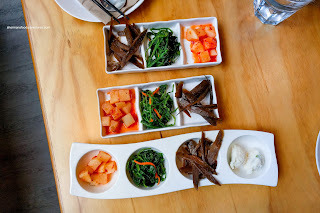 It had the umaminess of briny and sweet seafood as well as mushroom and seaweed. There was more ingredients than spicy broth. 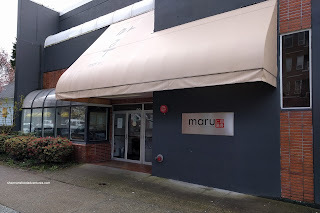 In the end, we were pleasantly surprised and satisfied with our lunch at Maru. It was also very reasonably-priced. I suggest you go check it out for yourself.